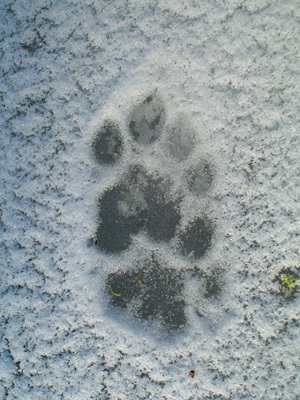 Cat tracks are distinct and often relatively easy to identify with practice. First, it is important to study the foot morphology of cats to better understand their tracks. Next, it helps to become more familiar with the kinds of wild cats that live in North America. Knowing your species will help you narrow down the possibilities. All North American cats share certain features in common. All of North American cat species have 5 toes on their front feet and 4 toes on their hind. Generally speaking, you will only see four toes in both front and hind tracks you find in the field. Although, cats do have 5 toes on their front feet, this fifth toe is further up on the leg and the pad is very reduced in size. Cats have toes that are arranged in an asymmetrical fashion. Like the finger on our hands, a cat’s longest toe is the toe 3 (on the front) and toe 2 (on the hind, since they only have 4 toes on that foot). Toes are numbered from the inside to the outside of the foot. Claws generally don’t register in cats, as they are kept sheathed in order to protect them and keep them sharp. Occasionally, while a cat is walking a steep slope, while it’s chasing prey, or if it’s climbing, you will see claws register in the tracks. 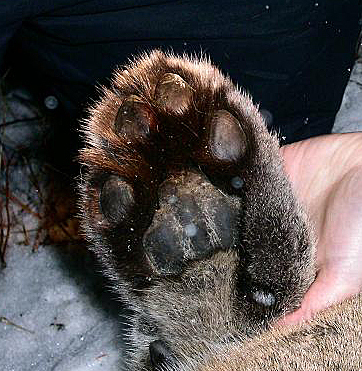 The main pads on the feet of cats - the metacarpal and metatarsal pads – are shaped like trapezoids or like “bubble-M’s.” Bobcats, house cats, Canada lynx, and cougars all have pads that have two lobes at the top and three at the bottom. In the other North American species, such as ocelots, jaguars and jaguarundis the main pads may appear much more trapezoidal and the lobes are much less pronounced. There are a variety of wild cats in North America that can be found north of the Mexican border. The most familiar are bobcats, cougars, feral cats, and lynx. Much more restricted in their range, are ocelots, jaguars and jaguarundi. Their tracks are very rarely seen in the United States. The tracks of feral cats can be found just about anywhere near human habitation. This introduced species is just a domestic cat that is living in the wild. Populations of them can be found in many parts of the country, especially in areas of urban fringe. The tracks of feral cats tend to be quite small, around 1 – 1 3/8” long by 7/8 – 1 3/4” wide for the fronts, and 1 1/8 – 1 1/2” long by 7/8 – 1 5/8” wide for the hinds. Bobcats are the most wide ranging native feline in North America and being only slightly larger than a very large domestic cat they have adapted better to human change than their larger relative, the cougar. They tend to be found in forest, swamps, deserts, and mountain landscapes. 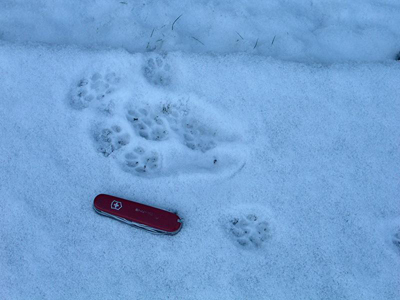 Bobcat tracks are generally larger and more robust than those of feral cats. They measure out at 1 3/4 – 2 3/8” long by 1 3/8 – 2 1/2” wide for fronts, and 1 9/16 – 2 3/8” long by 1 3/16 – 2 1/2” wide for hinds. To learn more about bobcat habitats, check out our Bobcat Tracks article. Cougar tracks are very exciting to find in the wild. They are very large animals, with good sized cat tracks. These creatures are also called mountain lions, pumas, and sometimes panthers. The tracks measure out at 2 3/4 – 4” long by 2 7/8 – 4 7/8” wide for fronts, and 3 – 4 1/8” long by 2 9/16 – 4 7/8” wide for hinds. Domestic dog tracks are frequently confused with the tracks of cougars. 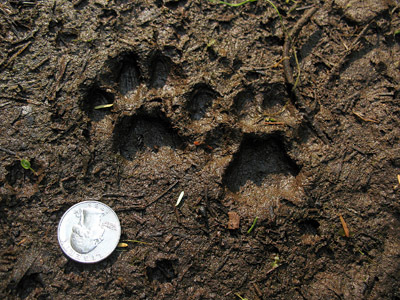 For more information on cougar tracks and sign, check out our Mountain Lion Tracks article. Canada lynx are cats of the deep snows, and are generally found in high mountain areas as well as in the northern boreal forests. Although lynx are similar in size to bobcats, their feet are actually much more similar in size to the feet of cougars! Their tracks measure out at 2 3/8 – 4 1/4” long by 2 3/8 – 5 5/8” wide for fronts, and 2 1/2 – 4 1/8” long by 2 1/8- 5” wide for hinds. Learning to recognize the tracks of cats will help you better understand the natural world around you, and perhaps, draw you into the life stories of these elusive predators.